Los Angeles, 2053. The city is overrun by crime, pollution, poverty, drugs, and prostitution. When the mayor's rebellious daughter Chandra is found dead and horribly mutated after experimenting with a drug, you, William "Blade" Hunter, are called upon to track down those responsible. It is an election year after all, and the mayor would prefer to have an ex-cop turned private investigator deal with this matter, rather than have his reputation jeopardized by an official investigation with media exposure. You soon discover the identity of the dealer and, with the help of your girlfriend, Karyn, track the source of the drug to a Chinese mafia ring in LA, which uses a warehouse in LA to manufacture the deadly MTZ drug. The ultimate goal of the drug kingpin however is to control the entire city. An ancient prophecy foresees the return of Bahumat, an evil warlord magician who came to power in the late seventh century of the Chinese calendar, using the power of evil to transform himself into a dragon and crush his enemies. Bahumat was eventually defeated and banished to the nether-world for 5,000 years. His return however is prophesied to occur on August 3 2053, which gives Blade just a few days not only to discover the whereabouts of the operation, but also to destroy it once and for all before the prophecy is fulfilled and LA turns to darkness. 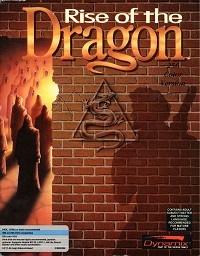 Rise of the Dragon, designed by Jeff Tunnell, was the first game that used the Dynamix Game Development System (DGDS), a point-and-click interface, later also used for games like Heart of China and The Adventures of Willy Beamish. You can follow different paths, leading to multiple possible endings, making the game highly replayable. Time also continuously passes by and events in the gaming world occur, displayed through cut scenes, whether you are present or not. The game also contains three arcade sequences with changeable difficulty settings, two being 2D platform shooters and another shooting sequence in first-person perspective. 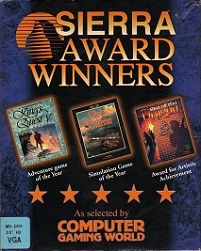 In 1991, Rise of the Dragon won a Special Award for Artistic Achievement from Computer Gaming World. The game was first released for DOS, Amiga and Macintosh. In 1992 a slightly altered multimedia version, produced by Game Arts (of Thexder fame), was released with voice acting, featuring Cam Clarke as Blade Hunter, and a brand new sound track, though many gamers prefer the original VGA release due to the more limited color range of the Sega CD. Although more adventures of Blade Hunter are hinted at in the game, no sequel was ever made. A fan however did develop a 3D remake, using the Unreal 4 engine.